I have been told that my room looks bigger in photos and on camera than it actually is. My room is fairly small - 2.6m x 2m and it has the boiler in it (the room used to be a bathroom) so a whole corner of the room is taken up with that (in a cupboard). Saying that, I am incredibly lucky and grateful to have any size room. I am constantly changing how I store items, I need things stored/organised in a way that helps my creative process when crafting. The main bulk of my room (one side of it) is my two desks. These desks are pretty big and I like the depth of them. One is my workspace in terms of my computer, where I blog/study etc. The other side is my crafting side. I have a few shelves above my desk, the one on the computer side holds cables in Gorjuss tins. 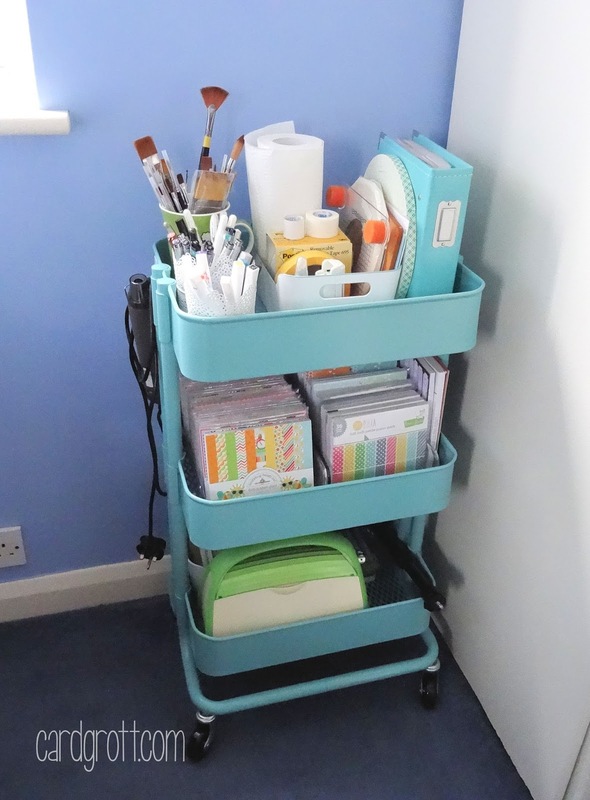 The ones above my craft desk hold washi tape, embossing folders and plates, colouring pencils, Zig Clean Color Real Brush pens and a few storage items. Underneath my desks I have the Helmer drawer units from Ikea. These are great if you have a smaller space. They are not very wide by pretty deep. They hold a lot of my supplies - inks pads (distress and most used), tools, envelopes, adhesives, colouring mediums etc. I like to keep my main crafting desk fairly clutter free. I have a lamp from Ikea on there, I have a Daylight bulb in it and this helps when filming videos. I have my Copic Markers (plus glitter pens) in Color Cubbies from Studio 3 Solutions (sadly I believe that they are currently out of business). I also have an acrylic letter rack that holds Copic colour charts, a notebook, Martha Stewart Mini Scoring Board and a little notebook that I write down what products I have used when creating. A large portion of my desk is taken up by my tool carousel. I love this thing, it holds a ton ... scissors, glue, tape runner, bone folder, rulers, corner punches etc. I then have my Raskog, I LOVE this also! On the top shelf I have tools I reach for a lot - pens, kitchen paper, masking tape, post-it tape, stamp press, masking paper, foam tape and my swatch book (you can see this in more detail here). The middle shelf holds paper pads, and the bottom shelf holds my Cuttlebug and cutting plates. On the other side of my room/the other wall, there is a cabinet from Ikea (sadly no longer sold) that holds my stamps, dies and 8.5"x11" cardstock (you can see more on that here). There is also a drawer at the bottom where my ink pads live, as well as some sprays and stamp cleaner. I also have stackables units. These are great because you can change around the configuration of drawers. The top one holds my 12x12" paper and cardstock and the bottom one holds my embellishments. On the top of them both, I have some magazines and reference books, as well as my camera and stencil storage (you can see more on that here). Here are the links to what I am using as storage in my room. Please click on the picture or wording to be taken to where I purchased it. Affiliate links are used on some products. This means that if you make a purchase after clicking on my link, I receive a small commission with no extra cost to you. I truly appreciate your support when using these links. Simple Stories Snap Binder Teal 6x8"
+ Muji Acrylic DVD boxes, Gorjuss tins and Studio 3 Solutions Color Cubbies - unable to link as they are currently unavailable, sorry. I should also just mention that I do have a cupboard that is not in my craft room. This holds my larger Xyron machines, older punches, my back up supply of PTI white cardstock and some ink refills. I hope you enjoyed having a look at my craft room today. Do you like craft storage as much as me? Thanks so much for visiting me today, have a great day! Thanks so much for your craft room tour. You are so organized. I love to see others' rooms to get ideas. Great tour! Thank you for sharing this! I love seeing other people's craft rooms as I don't have one myself, maybe one day (18 years later) I'll have mine back - currently is the kids' bedroom. 2 quick questions: Where do you buy your fun foams? (tried ebay/amazon/hobbycraft, they seem to do single sheet, I'd like a pack). What size card do you make? I usually buy my card blanks (pre-cut) from Hobbycraft, and the most common size is C6, but I'd like to start buying cardstock from Simon, but the size would be A2, can you get envelopes for that size? Thank you. Saw your post on Stamping Enablers, had to come visit, I'm a new follower now. 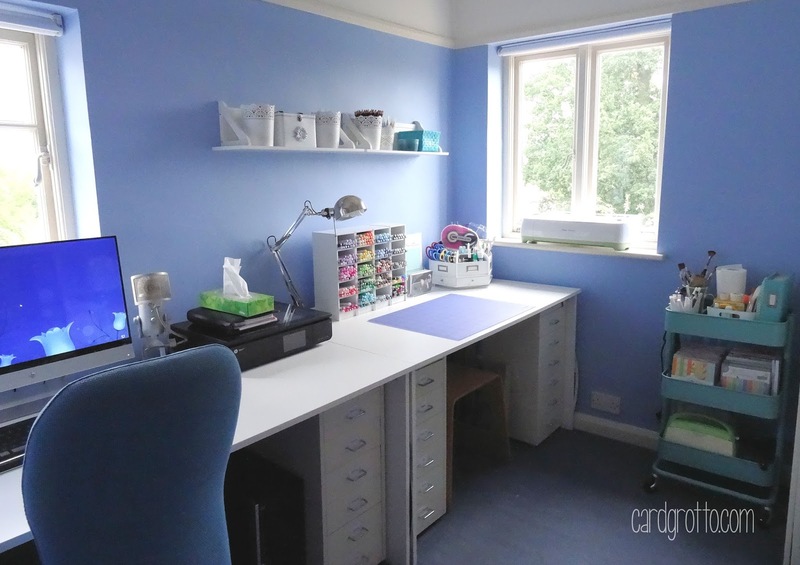 You have a GORGEOUS craft room, I could really get inspired in there! Thanks for the tour!!! 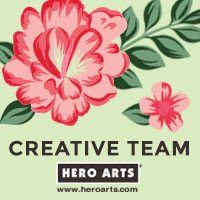 Your craft studio is beautiful! So clean and organized, and so many special touches! Love it!!! Thanks for the link to the Tim Holtz binder pockets, I didn't know what to use for my larger stamp sets. And nice to see someone else is a Kipling fan, I have....uhoh here goes....23 Kipling bags! So organised! 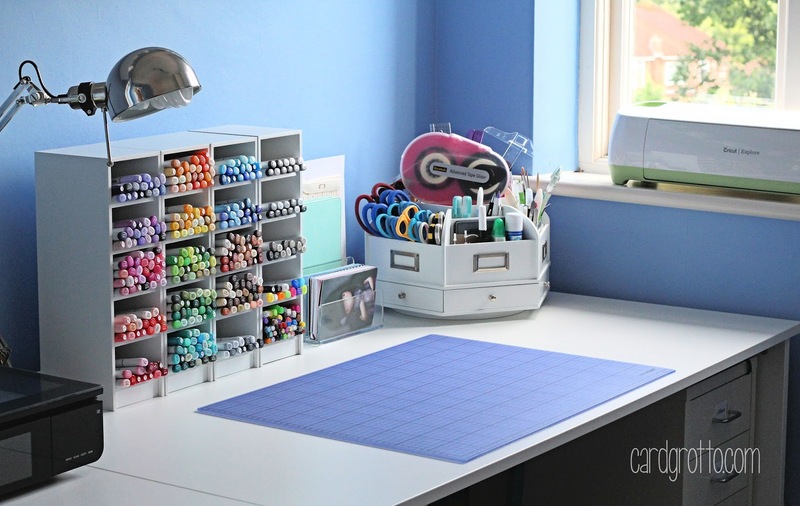 I want to LIVE in your craft room!! LOL! 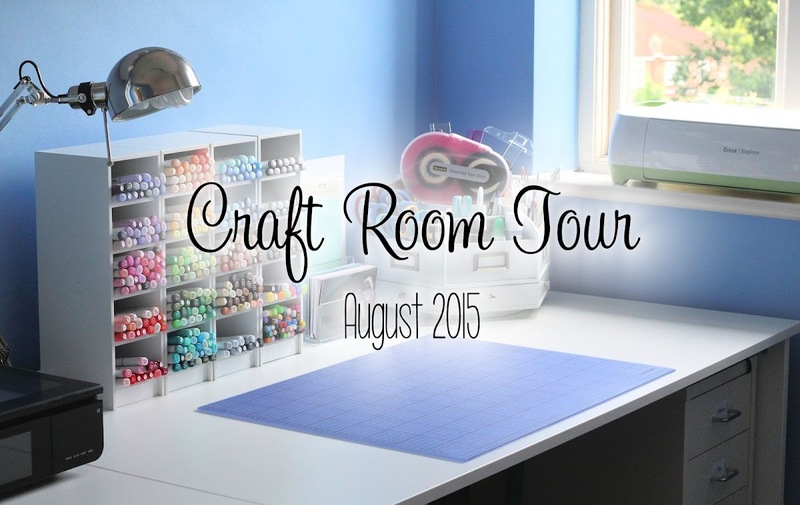 Great tour of your craft room. I too love watching these and have picked up one of two ideas for storage. DO YOU KEEP ALL YOUR STAMPS IN AVERY ELLE POCKETS ? I really did enjoy your craft room video, you have lots of lovely things and was honestly shocked at all those lovely enamel dots, amazing supply you have indeed. 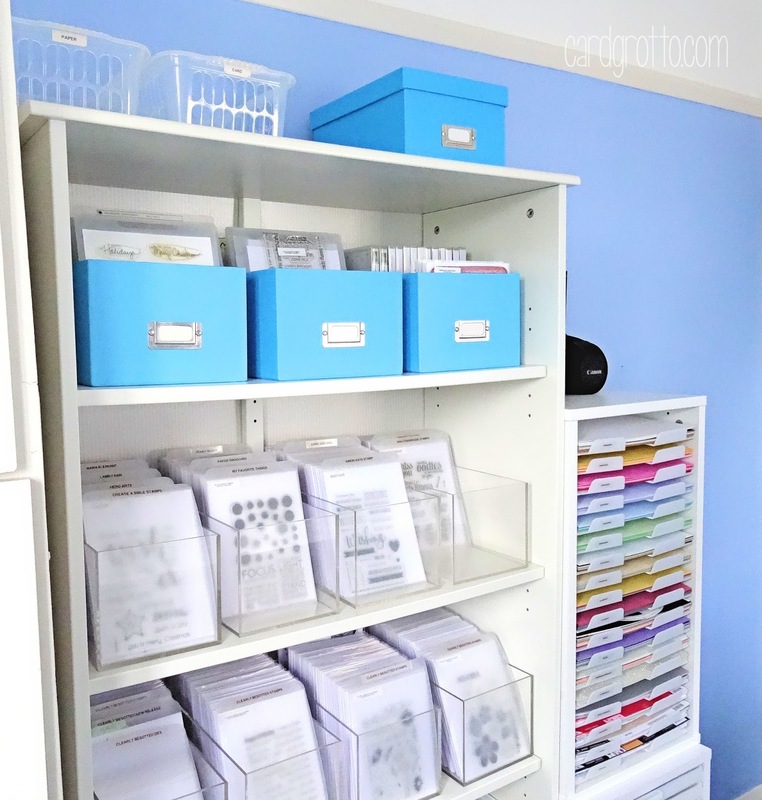 Thank you for sharing this with us and sharing all the storage ideas too. Wow ! je n'ai jamais vu un scraproom aussi bien rangée et organisée ! félicitations ! ♥ je vais puiser quelques idées pour me motiver et réorganiser mon espace ! Thank you for sharing, you are very organized and had some great ideas. I have many of those carts from Ikea and LOVE, LOVE, LOVE them because they do hold a lot and they are so reasonably priced. 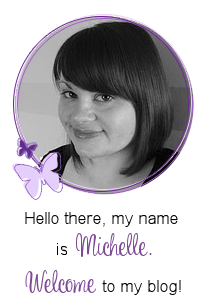 Michelle, thanks so much for sharing! I really enjoyed your video! Thanks Michelle! room looks great. just a quick question - what are the dividers that you are using for your stamps? with the avery elle storage envelopes. thank you! Hi! 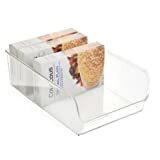 Can your Helmer drawer units (IKEA) store 8.5in x 11in paper, or are they too narrow? Thanks for the help! 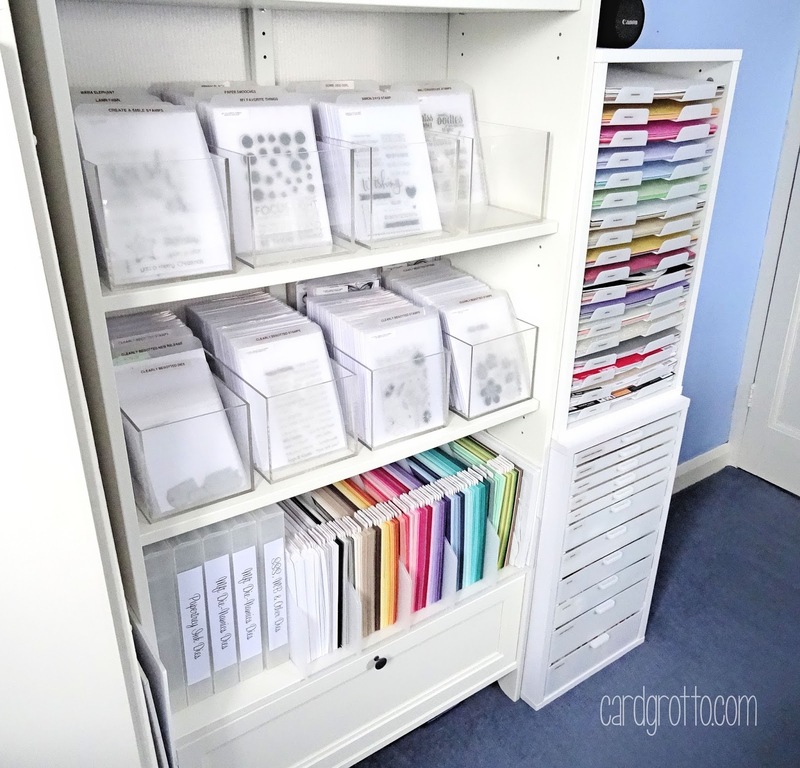 me where you get acrylic sheets for your stamp storage? Hi Liz, thanks for your comment. Sorry, I am not sure what you mean by acrylic sheets? Can you clarify for me please? Do you mean the acetate that I store my Papertrey Ink stamp in? Not sure what she was asking, but I'd like to ask about the acrylic bins your stamps are in. Where are they from? Hi Leeba, they are DVD boxes from Muji. Sadly they stopped selling them about a year ago. I am so sorry, it is such a shame as I love them and would like a couple extra myself!